The MGI® Rate & Recoil Reducing Buffer for the AR-15 / M4 / M16 family of weapons is a simple, self-adjusting, drop in unit that will reduce the rate of fire in your rifle with increased reliability. The MGI® Buffer, which is completely mechanical (not hydraulic) will decrease the rate of fire and reduce the recoil while increasing your accuracy potential. The MGI® Buffer comes in a standard carbine length, but can also be used with the addition of the MGI® Rifle adapter. 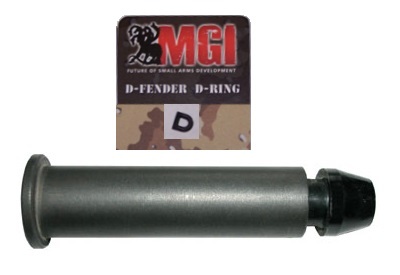 A D-Fender D-Ring also comes with the MGI® Buffer which will virtually eliminate extraction problems. Both the D-Ring and Buffer will work in any AR platform, regardless of the manufacturer of your rifle.